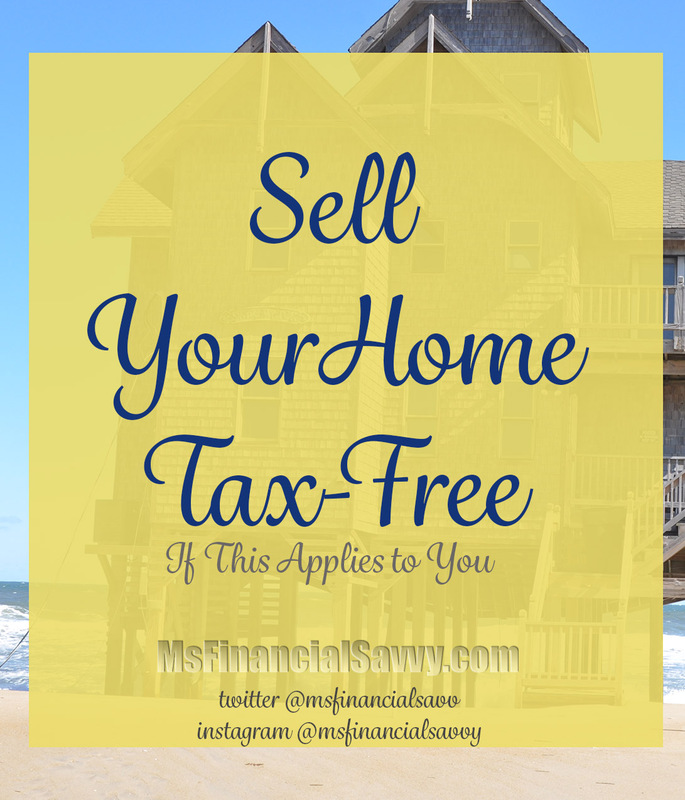 You can sell your home tax-free if it is sold within Internal Revenue Service(IRS) tax exclusions. The exclusions cover the price of an average home if you are single and live in an area of moderately priced homes. The tax exclusion you are entitled to doubles if you are married, and file taxes jointly. The type of home covered includes single-family homes, condominiums, cooperative apartments, mobile homes or a houseboat. To qualify for the tax breaks at the sale of your home your home must meet what the IRS calls “the eligibility test”. if you are married filing jointly. When you owned the home and used it as your main home during at least 2 of the last 5 years before the date of sale. If you did not acquire the home through a like-kind exchange (also known as a 1031 exchange), during the past 5 years. You did not claim any exclusion for the sale of a home that occurred during a 2-year period ending on the date of the sale of the home, the gain from which you now want to exclude. If one or more of these are not true, you might still be eligible. Keep reading to find out. Transfer of your home. When your home is transferred (or share of a jointly owned home) to a spouse or ex-spouse as part of a divorce settlement, you are considered to have no gain or loss. You have nothing to report on your tax forms and this entire publication does not apply to you. There are six eligibility factors the IRS uses to determine if your home qualifies for a tax exclusion when it is sold. You can exclude up to $250,000 of gain ($500,000 if married filing jointly) on the sale of your home if you meet the Eligibility test. You must figure out your gain or loss using the IRS formula listed in the IRS publication on, “Selling Your Home”. Determine whether you meet the ownership requirement. Your home was owned by you for 24 months (2 years) during the last 5 years leading up to the date of sale (date of the closing), you meet the ownership requirement. You received Form 1099-S, Proceeds from Real Estate Transactions, the date of sale appears in box 1 of Form 1099-S. Determine whether you meet the residence requirement. If your home was your residence for at least 24 of the months you owned the home during the 5 years leading up to the date of sale, you meet the residence requirement. The 24 months of residence can fall anywhere within the 5-year period. It doesn’t even have to be a single block of time. All you need is a total of 24 months (730 days) of residence during the 5-year period. If you were ever away from home, you need to determine whether that counts as time living at home or not. To not exceed the residency requirement, a vacation or other short absence can count as the time you lived at home (even if you rented out your home while you were gone). If you have a disability and are physically or mentally unable to care for yourself, you only need to show that your home was your residence for at least 12 months out of the 5 years leading up to the date of sale. In addition, any time you spend living in a care facility (such as a nursing home) counts toward your residence requirement, so long as the facility has a license from a state or other political entity to care for people with your condition. Determine whether you meet the look-back requirement. 1) If you did not exclude the gain when selling a home on your tax returns for the previous two years. 2) And you do not intend to do so on any returns or amended returns for the past two years that have not been filed. The look-back requirement has been met by you. Check to see if there is anything about your situation that could affect your answer to Eligibility Step 2—Ownership through Eligibility Step 4—Look-Back. You’ll need to review the IRS section, Does Your Home Qualify-Details and Exceptions in the IRS “Selling Your Home” publication 523. A marriage, separation, divorce, or the death of a spouse occurred during the ownership of the home. The sale involved vacant land. What you sold was a “remainder interest” (such as ownership of a home in which another person has the right to live for the rest of their life). Your previous home was destroyed or condemned. Review your eligibility. If you meet the ownership, residence, and look-back requirements, your home sale qualifies for exclusion, then you would use the IRS rules to figure out your gain or loss in the IRS publication 523. If you did not meet all the tests in Eligibility Step 1 through Eligibility Step 5, earlier, your home is not eligible for the full maximum exclusion. However, you may still be eligible for partial exclusion. When you can show the main reason you sold your home was because of a change in workplace location, for health reasons, or because of an unforeseeable event, these may qualify as partial. 1. Keep more or all of your profit when you sell. 2. Gives you more money for the down payment on your next purchase. 3. Allows money to pay off bills, fund vacations or educations, purchase a car, boat, etc. 4. Allows no time frame to worry about purchasing another house. 5. Sell your rental house now tax-free if it was your primary residence any 2 of the past 5 years. Lois Center-Shabazz, aka MsFinancialSavvy, is a Money Strategist specializing in helping others with Mega-Money Management through what she calls the Money Trio of Guerrilla Budgeting | Sane Savings | Investing Insights. Visit the top toolbar of MsFinancialSavvy.com and schedule a discovery session with Lois. She is also a nature photographer (www.arbazz.net), acrylic painter (www.artbazz.com), and has an online calculator website at www.livericalculators.com. Lois is the author of the Live Rich Save Money! series on Amazon Kindle.